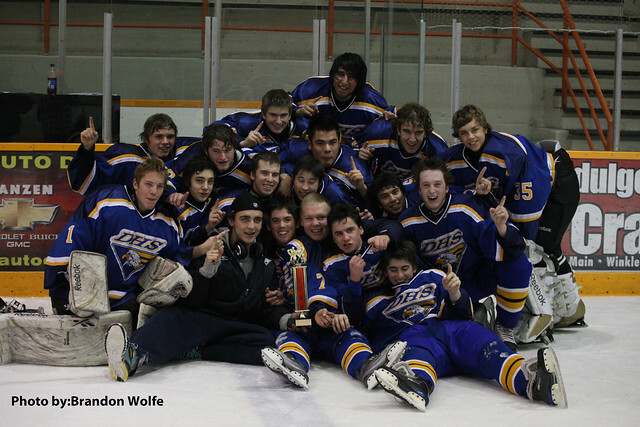 The DHS Eagles celebrate after winning the Winkler hockey tournament. After Day one…DHS wins their pool and advances to the A side Semi-final game on Sat vs Mountain @ 1pm…a team that has beat DHS twice this year. Win and we play in finals at 7pm…lose play at 5pm for Third Place. Blair Dingwall, the 6th shooter for DHS, scored the second tally and then Kim Wildhaber shut the door and stopped the Kenora shooter to seal the victory. This is the 2nd year we have faced Kenora in the finals of the Winkler Tournament and won…we successfully defended our title in dramatic fashion with the Shootout win. Despite being outshot by a 38-15 margin during regulation play, we played well defensively keeping the Broncos’ opportunities to the outside and minimizing quality second chances by clearing all rebounds quickly. Wildhaber also played a solid game as well with a solid performance and only allowing one scorer out of 6 in SO. The rivalry between DHS and Kenora continues this week as the Eagles travel to Kenora on Tues and the Broncos visit Dryden on Friday night.